I’m not one for making new year resolutions. If I want to make a change, I just do it. I don’t need a fresh calendar to tell me that its time to alter my life. But our society resets expectations each January 1. It’s hard to escape, especially as I look ahead and plan for work in 2016. You may or may not recall, last year I took on a new job at the newspaper where I’ve worked for the last 13+ years. I went from breaking news/criminal justice reporter to outdoor/adventure reporter. I tried loads of new activities last year – curling, stand-up paddleboard yoga and bass fishing among them. So when a friend asked me to join festivities for a 5K snowshoe race in early January, I readily agreed. Running on a single track loop through the beautiful state park. Come race week and there was no snow on the ground and we’d had the warmest, least snowy December on record. While I loved the lack of shoveling, snow is kind of a necessity for a snowshoe race, eh? The race director told me the race would go on without snow, but would likely become a trail run. No problem, I’ll roll with it. Come race morning and there was fresh snow on the ground – and the closer I got to Harriet Hollister park (the race site) the more snow I saw. Sadly, there wasn’t quite enough snow for snowshoes, so instead the event became a 4.4-mile traction run. I donned my YakTrax and prepared mentally for my first snowy trail run. About 80 runners took part in the event, which was a blast. I had no idea what to expect going into it. I’d run trails a few times before, but never in the snow and never in a race. The men started 10 minutes before the women because much of the route through the woods was a single track course. Guys, I can’t begin to tell you how beautiful it was. I gasped when I saw the below view and nearly tumbled off the trail because I was enamored with the sights. I ran with the best of them and my traction fell off my foot about 3/4-mile into the race. (ah well, what can you do?) I paused and fixed it, and took a much needed breather after trekking up a hill. Phew! I made the conscious choice not to wear a watch for the race. I loved not knowing my pace and running in the moment, but it also backfired because I had no idea how far I had gone or how far I had left on the course. Live and learn. Much of the route was single track, but it was incredibly well marked. A fresh layer of snow coated everything, causing me to look all around in wonder instead of paying attention to my footing. Sorry friends, I’m not sure how to embed the video here, so instead, please click the picture below for the link! 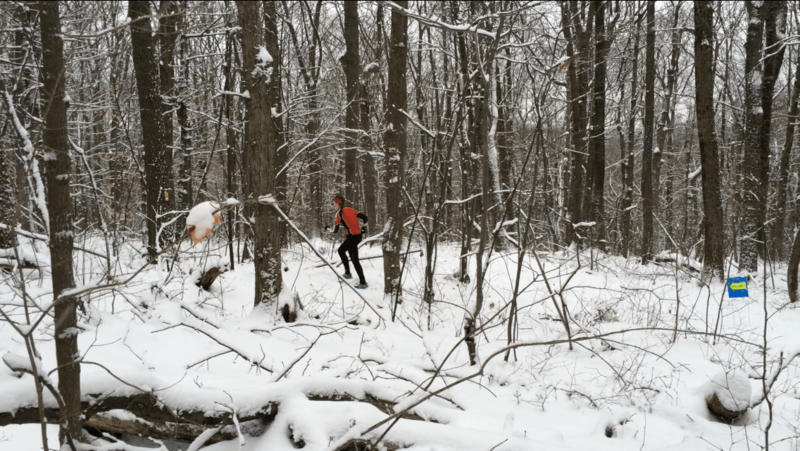 Have you ever run in snowshoes? Have you tried trail running? Tell me about it in the comments! This entry was posted in Fun stuff, Race Recap. Bookmark the permalink. ← Finding your motivation – what drives you? Thanks Pam! I loved the run even though we didn’t end up in snowshoes (next time!) It was a great experience, even in YakTrax, and I’ll be back for sure. I run in snow a lot here in Rochester, but I’m typically on the roads, not in the woods. So peaceful and serene! Hope you are doing well and happy 2016! OMG you’re an outdoor adventure journalist?! That sounds amazing. I wish I had that job! Maybe one day I’ll work my way up to a race like this one! Too cool, Vic!